Contrary to popular belief, Rosa Parks wasn’t too tired. She wasn’t incapable of leaving her seat when bus driver James F. Blake demanded her to do so. She was properly seated in the colored section, but because the white section was full, Blake attempted to move Parks back to accommodate the white patron. Parks, the mother of the civil rights movement, made the decision to remain in her seat on a Montgomery, Alabama, bus because she didn’t believe she should have to move because of her race, even though that was the law. 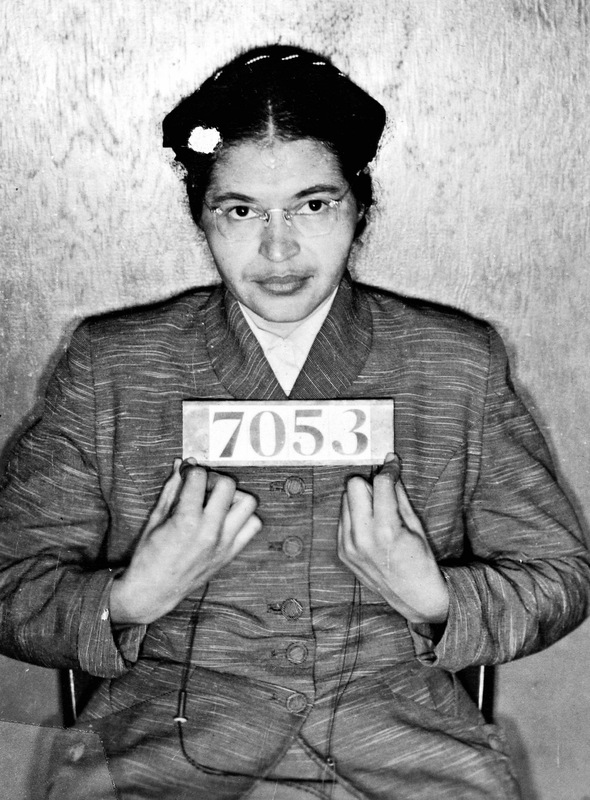 In the middle of the crowded bus, Parks was arrested for her refusal to relinquish her seat on Dec. 1, 1955 — 61 years ago. Parks, 42, paid a fine and was briefly locked up. 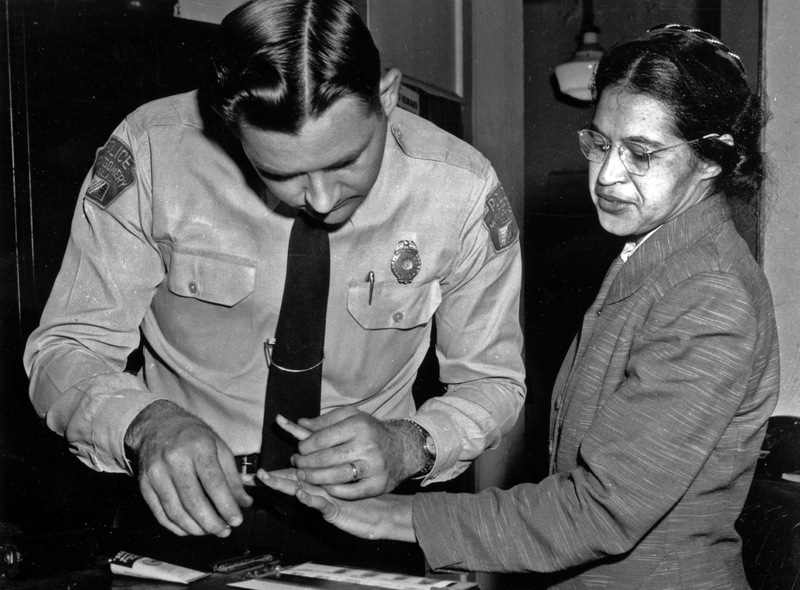 Rosa Parks is fingerprinted by police. This event then lit a fire under the effort to end segregation and promote equal citizenship and treatment for African-Americans. It was by no means the first bus protest to occur — Bayard Rustin (1942), Irene Morgan (1946), Sarah Louise Keys (1952) and Aurelia Browder, Claudette Colvin, Susie McDonald and Mary Louise Smith, who formed the successful Browder v. Gayle 1956 lawsuit, were all arrested in Montgomery for refusing to give up their bus seats before Parks’ protest. However, she was also the secretary of the Montgomery chapter of the NAACP. For the NAACP, Parks was the perfect person to be the face of the Montgomery bus boycott, and on the day Parks went to court, the group arranged for a one-day boycott of passenger buses. This later led to a more expansive boycott of the buses by the Montgomery Improvement Association (MIA) that lasted 381 days and decimated the buses’ revenue, because about 75 percent of the people who rode buses were black. 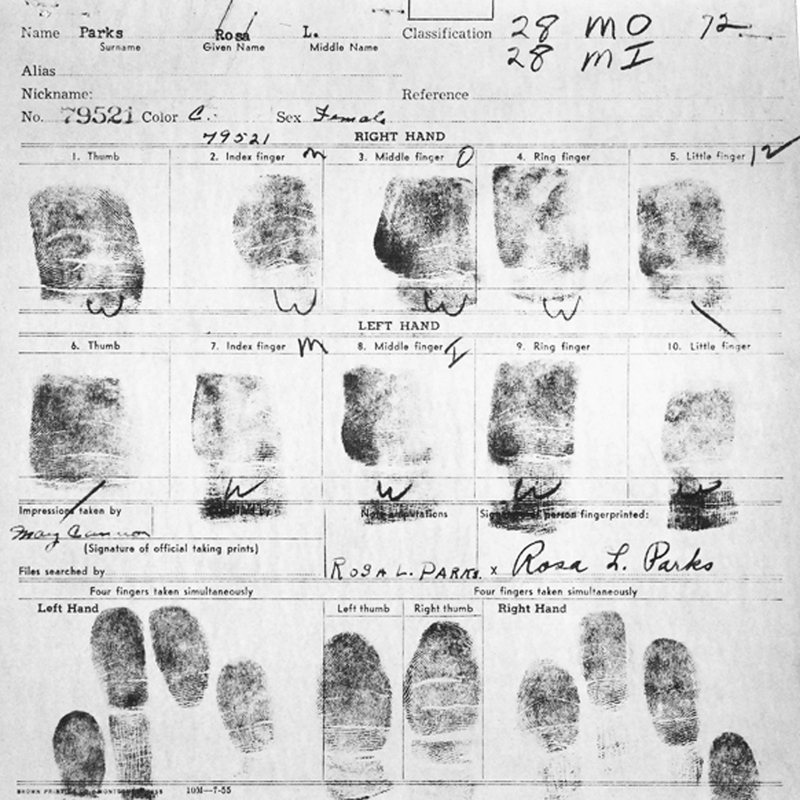 Fingerprint card of Rosa Parks’ civil case. With Parks, the MIA had someone to rally the community around, but it lacked a charismatic spokesperson to help spread the nature and message of the cause. At the time, Martin Luther King Jr. was only 26 years old, a basically unknown pastor and newcomer to Montgomery, who Parks later said was the choice to lead the MIA because of his lack of enemies in the town. Even though Parks was fired from her department store seamstress job, received death threats for years following the boycott, and King’s home was attacked, the team persisted and the bus boycott was a huge success because of their perseverance in the face of extreme danger. Almost a year later, on Nov. 13, 1956, the U.S. Supreme Court affirmed the decision of a district court that ruled segregation on buses operating in Alabama was illegal because it deprived people of equal protection under the 14th Amendment, in the case of Browder v. Gayle. Future Supreme Court Justice Thurgood Marshall was a member of the NAACP legal team that fought the case. Rosa Parks’ mug shot, 1955. Parks, who moved to Virginia and Michigan following the boycott and worked in Rep. John Conyers office, died in 2005 at the age of 92. She became the 30th person Congress honored by having her coffin sit in the Capitol Rotunda. Parks was the first woman accorded the privilege, and her coffin was placed on the same catafalque that was built for Abraham Lincoln’s coffin. “I have learned over the years that when one’s mind is made up, this diminishes fear; knowing what must be done does away with fear,” said Parks in the 2000 book Quiet Strength: the Faith, the Hope, and the Heart of a Woman Who Changed a Nation” with Gregory J. Reed.